When moist wind hits a mountain, it is forced to rise. Rising air expands due to lower pressure and this expanding air cools, allowing the moisture to condense into snow. This process is called orographic lift and is responsible for creating more than half of the snow that falls for the resorts on larger mountains. Let’s take a look at the mountain ranges in Colorado, how these ranges create their own weather, and where you can find the highest snow totals. The climate of Colorado is continental, meaning that it is far from an ocean moisture source. This often means less snowfall than states that are closer to the coast, but it also means light, dry snow is the normal type of powder. Colorado is comprised of many mountain ranges, and this complexity makes forecasting snow especially difficult. The most snow falls in the southern San Juan mountains and also in the Park range. You’ll notice that these two ranges are on the southern and northern edges of the state, and there is a good reason that the highest snowfall totals are found here. When moisture is blown in from the Pacific Ocean, the edges of Colorado rob the atmosphere of moisture (in the form of snow) before it reaches the middle of the state. Resorts like Wolf Creek and Silverton sit in the southern part of the San Juans and often see the most snow in the state. Steamboat is located in the Park Range and can also experience some of the highest totals in the state. The mountains nearest to Denver and along the continental divide can see the deepest snow from storms that linger to the southeast of Colorado and create winds from the east. These easterly winds strike the continental divide head on and create lots of snow. In fact the highest 24-hour snowfall total in the United States is owned by a location in this region just up the road from Eldora ski area. The record was 76 inches in 24 hours and was set on April 14-15, 1921. Mountains along Interstate 70 are some of the most skied in the state due to the access from the highway. These mountains do receive good snowfall, but mostly from one wind direction. Storms that bring winds from the northwest drop the most snow on mountains such as Vail, Copper, Breckenridge, and Loveland. This wind direction means that few mountains block the moisture before it hits the I-70 peaks and drops its powder. 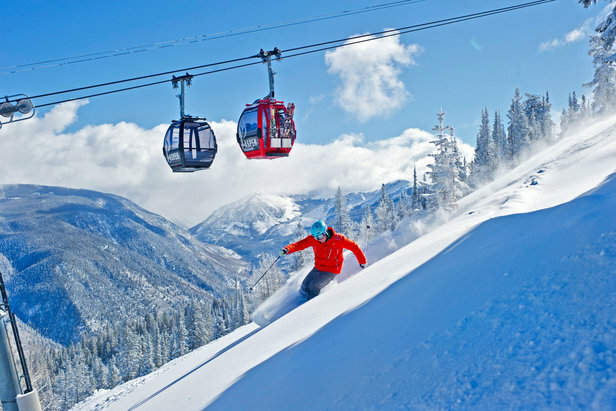 Finally, the Elk range is a massive grouping of high peaks and includes resorts such as Aspen and Crested Butte. The most favorable wind direction for these mountains is from the west. The San Juans to the southwest tend to block storms coming from that direction, and a northwesterly wind tends to not provide as much snow as a wind from the west. Snow amounts at one mountain can be double or triple those at a resort only 10 miles away, and this is all based on mountain location and wind direction. Now you’re in the know!